Are your wisdom teeth making you say ouch? The third molars often appear between ages 16 and 25, and they can create some real discomfort when they do. Before you call the oral surgeon in Houston — or until you can make it into your appointment — there are a few simple steps you can take to find relief. Here are the top home remedies for aching wisdom teeth. Sometimes just one wisdom tooth will want to emerge — but for some lucky people, all four will try to come out at one time. No matter how many of these third molars you have attempting to make an appearance, wisdom teeth extraction is the likely solution. But in the meantime, here’s what to do to ease discomfort and go on with your day. In Texas, it’s probably your grandparents’ all-purpose advice, and they’re right. One of the easiest ways to alleviate oral pain of any kind is rinsing your mouth with warm salt water. And it couldn’t be easier — just dissolve a couple of tablespoons of salt in boiling water. Let the mixture cool, and rinse your mouth with it for a few minutes. You’ll feel relief almost immediately, and the salt also helps to kill bacteria to reduce the risk of infection. To reduce swelling and ease discomfort, wrap a protective cloth around an ice pack (a bag of peas will do just fine) and hold it up against the side of your mouth that hurts. Apply the ice pack in 10 or 15 minute intervals — 10 minutes on, 10 minutes off. You can use the ice pack for as long as you need to to ease pain. 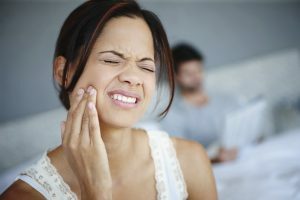 Numbing the pain is an obvious choice for alleviating wisdom tooth discomfort. Find an oral gel that has the active ingredient benzocaine and place it on the protruding tooth. Avoid eating or chewing gum after you have applied the numbing gel, as you’ll be more likely to accidentally bite and injure your cheek or tongue. Feel free to take Ibuprofen or your favorite over-the-counter pain medication to relieve your wisdom tooth pain — but be sure to follow the instructions carefully. Do not drink alcohol with pain medicine, and be aware of the advised dosage. Similar to salt water, a natural remedy for aching wisdom teeth is with cloves or clove oil. Place a whole clove (or the oil) in your mouth, directly onto the aching tooth. Cloves will numb the area, allowing you to get back on with your daily routine without an aching mouth. We want to help you alleviate pain related to the wisdom teeth — but remember that ailing third molars require extraction. When ignored, impacted or infected wisdom teeth cause real trouble in an otherwise healthy mouth. Dr. Koo and Dr. Weil provide comfortable wisdom teeth extractions at Piney Point OMS! Schedule an appointment today. by: Dr. Steve Koo at January 16, 2017 .